Upolu, 사모아의 마타레바 비치 팔레스 | 호스텔월드에서 예약하세요. Our beach is one of the largest white sandy beaches on the Island and has recently been recognised as a Marine Conservation Area. One of the projects that we’re developing is coral grading and replanting and we have many more projects in the pipeline to improve our environment for future generations to enjoy. Our 16 beach fales and 5 cabins offer accommodation for individuals, couples, families and other groups. 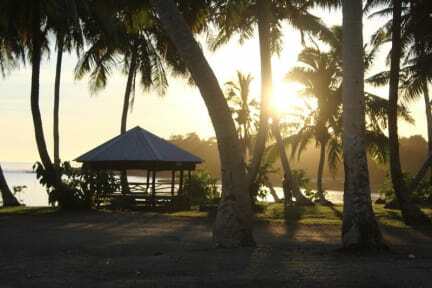 Stay with us and sleep in a traditional beach fale and experience waking up to the sound of waves crashing on the reef. We offer easy water access suitable for children, swimming and snorkelling possibilities in all tides. Tasty food is available and at our beach bar you can enjoy a cold beer (or ice cream) whilst taking in a stunning sunset. 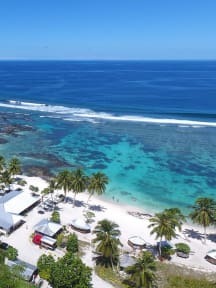 We also offer some unique activities such as exploring our lava tube, snorkelling in daytime and at nighttime, Savaia giant clams, joining us for Sunday church (Bahá'i) or learning about the traditional Umu. Feel free to skip all of that and just relax on our white sandy beach with a coconut in your hand.